Once you have made it past the harsh exterior, globe artichokes are relatively easy to cook and a Mediterranean delicacy. Favoured by Michelin-starred chefs for their delicate flavour and elegant appearance, especially in their baby form, artichokes are a great addition to an impressive meal. In season from May until November, the demand for artichokes in the UK is relatively low compared to that of Europe so artichokes in most stores will probably originate from either Spain or France. To prepare an artichoke requires technique and skill. Make sure you work quickly as artichokes discolour at an alarming rate. Artichokes are traditionally cooked ‘à la grecque’ in a mixture of acid, spices and herbs to give them a pleasant tangy flavour. If you have the equipment then you may also be interested in our guide on how to cook artichokes sous vide. 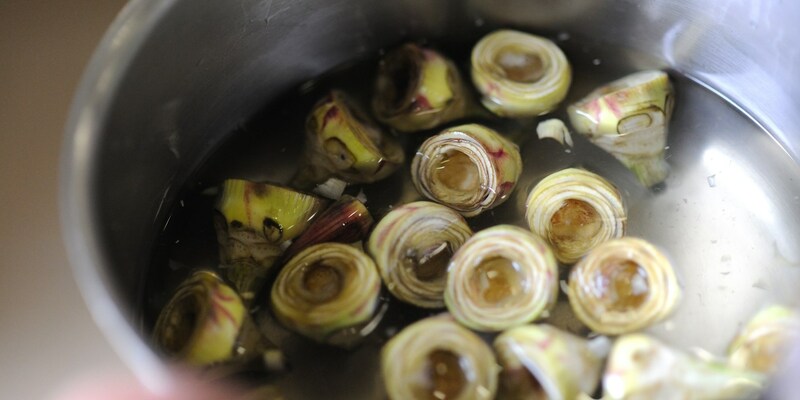 Once cooked, the artichokes are ready to eat straight away however they can also be pan-fried, grilled or even puréed. When you have mastered this technique, why not give Martin Wishart's Artichoke barigoule, Marucs Wareing's Queen Anne's Tart or Tom Aikens' Poached turbot with artichoke and Sauternes.